What Are Common Causes of a Broken Toe? What Are the Signs and Symptoms of a Broken Toe? What Are the Symptoms and Treatment Options for a Broken Little (Pinky) Toe? What Natural or Home Remedies Can Help Soothe the Pain and Swelling of a Broken Toe? What Is the Medical Treatment for a Broken Toe (Meds, Buddy Taping, Booting)? Can Broken Toes be Prevented? The definition of a toe fracture is when one or more of the toe bones of the foot are broken (fractured) after an injury to the foot or toes. A broken toe usually is caused by trauma or injury to the foot or toe, such as a heavy object dropped on the foot or toe, or stubbing the toe. Stress fractures of the toe are caused by repetitive movements, such as in certain sports. feeling that shoes are too tight. If the little toe (pinky toe) is injured you usually will still be able to walk. Immediate complications of a broken toe include nail injury (subungual hematoma) or open (compound) fracture, in which the broken bone in a toe fracture protrudes through the skin. Delayed complications of a broken toe that occur after the broken toe has healed include arthritis, pain, stiffness, or deformity. 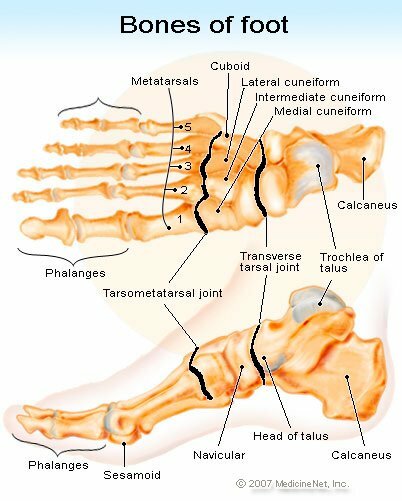 The fractured bone may not heal completely (nonunion), or heals improperly (malunion), requiring surgery to fix the toe. Treatment for a broken toe depends on the location and severity of the toe fracture. The fracture may need to be put back into place (reduced) and splinted or casted. If there is an open wound near the injured toe, a tetanus shot and antibiotics may be necessary. If the toe fracture is a minor or small fracture in a bone of one of the small toes, the doctor may tape a broken toe to the toe next to it for support (buddy taping). Once you have been diagnosed with a broken toe by a doctor, there are home remedies to care for the broken toe that can help decrease pain and swelling, including elevating the injured foot, icing the injured toe, and rest (avoid walking on the injured foot). Use crutches of needed. Broken toes usually take about six weeks to heal. If problems last longer than six weeks, another X-ray may be needed, or the injury should be rechecked by the doctor to see how the bone is healing. The prognosis for a broken toe is generally good. Simple fractures usually heal well with no problems. Bad fractures are at risk for developing arthritis, pain, stiffness, and deformity. Broken toes usually result from trauma or injury to the foot or toe. Injuries such as stubbing a toe or dropping a heavy object on a toe may cause a fracture. A broken toe may result from prolonged repetitive stress or movements, as in certain sports activities. This is called a stress fracture. Broken toe symptoms are similar to sprained toe symptoms. Sprained toes may be more mobile, and not deformed, and may not hurt as much as a broken toe. Some other complications may develop as a result of the fracture. Complications can occur immediately after the injury (minutes to days), or can occur much later (weeks to years). Nail injury: A collection of blood may develop underneath the toenail called a subungual hematoma. If it is large, it may need to be drained. 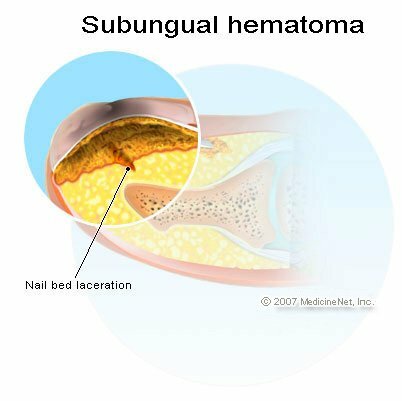 To drain a subungual hematoma a doctor will make a small hole in the toenail to drain the blood out. If the hematoma is very large or painful, the entire toenail may need to be removed. Open fracture: Rarely, the broken bone in a toe fracture may protrude through the skin. This is called an open or compound fracture. Careful cleansing of the wound and possibly antibiotic medication will be needed to prevent the bone from becoming infected. Sometimes surgery may be necessary. After the toe fracture heals, the person may still be left with arthritis, pain, stiffness, or even a deformity. Sometimes, the fractured bone will not heal completely (called a nonunion), or will heal improperly (called a malunion). Rarely, surgery may be necessary to fix this problem. Symptoms of a broken little toe (pinky toe) are the same as with the rest of the other toes. However, while a broken pinky toe may be painful, usually it does not limit a person's ability to walk. What is the treatment for a broken little (pinky) toe? Treatment for a broken little toe (pinky toe) usually involves buddy taping. This means the injured toe is taped to the toe next to it for support. The non-injured toe acts like a splint. Place a small piece of cotton or gauze in between the little toe and the toe next to it to prevent sores or blisters, and then loosely tape the toes together. The tape can be removed for bathing and put back on afterwards. Toes may need to be buddy taped for up to 4 weeks to heal. A doctor will ask questions to determine how the toe was injured and will examine the injured toe and possibly check for other injuries. It is best to seek medical evaluation soon after the injury to ensure proper treatment and healing. A doctor may take an X-ray to determine if a toe is broken. X-ray are not always necessary to make the diagnosis of a broken toe, especially if the break is in one of the smaller toes. Do I need to see a doctor for a broken toe? A broken toe may or may not require prolonged medical care. Home remedies to care for a broken toe at home include elevation, ice, and rest (see home remedy section). If the fracture is severe it may require medical attention, a tetanus shot, pain medication, or surgery. The injured toe should be assessed by a health-care professional to determine if more than simple immobilization is necessary. These remedies can be taken at home to help decrease the pain and swelling, and help the fracture heal properly. Swelling that occurs after the injury worsens pain. To decrease swelling (and pain), keep the foot raised above the level of the heart as often as possible. Prop the foot up on some pillows, especially when sleeping. Reclining in a lounge chair is also helpful. Put ice in a plastic bag and apply it to the injury for 15 to 20 minutes every 1 to 2 hours for the first 1 one 2 days. Frozen peas or corn may be used in place of ice as it conforms to the injured toe more readily than ice cubes. Place a towel between the skin and the bag of ice, frozen peas, or corn to protect the skin from freezer burn. Avoid strenuous exercise, prolonged standing, or walking. Crutches or a special shoe to wear when walking (to avoid putting weight on the fracture) while it heals may be necessary. Depending on the location and severity of the toe fracture, the fracture may need to be put back into place (reduced) and splinted or casted. If there is an open wound near the injured toe, a tetanus shot and antibiotics also may be necessary. Usually only acetaminophen (Tylenol) or ibuprofen (Motrin) is needed for pain. Talk to the doctor before taking any new medications. For a severe fracture, the doctor may prescribe stronger pain medication. Elevating the foot and using ice packs will help reduce pain. If the toe fracture is displaced (the two ends of the broken bone are out of place) or rotated (the toe is pointing in the wrong direction), the doctor may need to put it back into place (reduction). Sometimes an injection of medication (anesthesia) may be needed to numb the toe before it is put back into place. After a reduction, the broken bone will need support to hold it in place while it heals. If the toe fracture is a minor or small fracture in a bone of one of the small toes, the doctor may only need to tape the injured toe to the toe next to it for support. This treatment is called buddy taping. If the toe is buddy taped, it is usually safe to bathe, and then replace the tape afterward, but check with the doctor to make sure it is OK. If the tape is replaced by the person with the toe injury, it is recommended they put a small piece of cotton or gauze between the toes that are taped together. This prevents the skin between the toes from developing sores or blisters. A cast is usually not required for a simple toe fracture. A hard-soled, sturdy, and supportive shoe should be worn. The doctor may give a special shoe to wear if the foot or toes are very swollen. A cast (or even surgery) may be needed if the big toe is broken, the fracture involves a joint, or a lot of small toe fractures occur at once. A cast may also be needed if a bone in the foot or leg is broken in addition to the toe. In some cases, the doctor may prescribe a walking boot. This will allow you to bear weight on your injured foot, while protecting the toe so it can heal. Simple fractures usually heal well with no problems. However, a very bad fracture or a fracture that goes into a joint is at risk for developing arthritis, pain, stiffness, and possibly even a deformity. Talk to the doctor to find out when to schedule an appointment to have the injured toe evaluated to ensure it is healing properly. If any problems or complications develop, the appointment should be scheduled sooner. Worsening or new pain not relieved by pain medication, and the measures described in the treatment section. Which specialties of doctors treat broken toes? You may initially see a primary care provider (PCP) such as a family practitioner or a child's pediatrician when you first injure your toe. You likely will be referred to an orthopedist or orthopedic surgeon, who specializes in disorders of the musculoskeletal system, or a podiatrist, a specialist in conditions of the foot, for treatment of a toe fracture. If you are diagnosed with a broken toe in a hospital's emergency department you will be treated by an emergency medicine specialist. Radiologists will read an X-ray or MRI, though they will usually report back to your primary care physician or emergency medicine specialist and you will not directly consult with them. To help prevent an injury resulting in a broken toe, wear sturdy and supportive shoes. American Academy of Orthopedic Surgeons. "Toe and Forefoot Fractures." Updated: June 2016. Gravlee, J.R., MD. "Toe fractures in adults." UpToDate. Updated: sep 26, 2016. Please describe your experience with broken toe. How did you break your toe, and how long did it take to heal?